While I think that this may be the year Powell MAY edge out Bolt, he’s gonna have to bring his 2007 form with him. Also, I would rather pick Dix or even Rodgers over Gatlin for 3rd. I thought i saw that Rodgers failed a drug test… so he may be out of the discussion. Oh really?? I hadn’t heard that. EDIT: Found an article talking about it. If Rodgers is lucky he will be cleared in time for Worlds. Powell winning a World Championship would blow my mind. Richard Thompson’s 9.85 has to put him in the discussion. Beijing silver medalist, 5th in Berlin. The guy has game. And where does Blake figure? He just ran 9.95 against a 1.6 wind and seems to be rounding into form nicely. No predictions here. I think Bolt, Powell or Blake could win and Thompson, Dix, Rodgers, Gatlin and even Lemaitre could be fighting for lessor medals. It should be an awesome race. With Bolt seeming to perhaps be un-Bolt-like it makes this much more interesting! With Bolt seeming to perhaps be un-Bolt-like it makes this much more interesting! That is very true. He (Bolt) hasn’t ran any “mind-blowing” times yet this year. In 2009, his two fastest 100m times before his WC’s Final were a 9.79 and a 9.81. This year he has only clocked a 9.88. Who knows which Bolt we’ll see in Daegu. I mean, really? I’m just confused as to what could possibly, POSSIBLY lead either of you to think Powell has a chance at taking Bolt in a championship final 100m. Is it Powell’s PR? Nope, that wouldn’t make sense. Is it Powell’s history of success in championship finals? Well that would make even less sense than the one I just said. Is it Powell’s record of beating Bolt head to head over 100m? I could be wrong here, but I believe the only person to beat Bolt in a 100m race since 08 isn’t even going to be running at Daegu, so this one is out, too. I’m going to assume it’s because Powell is currently #1 in the world with a 9.78, which is really great if you totally ignore the fact that Bolt ran a full two tenths of a second faster than that in 09. Then you have to ignore the fact that Powell is running only 0.06 off his PB and is nearly 29, even if he has finally gotten his consistency down (unlikely since in the month and a half since the 9.78 his fastest performance has been a 9.86 with MORE wind, +2.0 in fact.) the odds of him PRing at all are small, and the odds of some sort of massive drop into the mid 9.6 range are even smaller. If Powell is off his best at all he runs a 9.80 at best in the final. If Bolt runs, let me say this again, TWO TENTHS off his PR and he still finishes the race in a time of 9.78. Also, CwU, the bolded part of your post really made me lol really hard since in Osaka Powell was the WR holder in the 100m and got THIRD in the 100m final in 9.96. This is what Powell managed in 07, 08, and 09. 2007: Powell ranked #1 in world in 100m with World Record of 9.74. WC 100m Finals in Osaka he finishes 3rd in 9.96 behind the #2 and #3 in the world, Gay and Atkins, neither of which had come within a tenth of his 9.74 that year. Beijing finals he finishes 5th in 9.95 behind (besides Bolt) three guys who ran either SBs or PBs of 9.89, 9.91, and 9.93 in that final. Again losing to multiple people who should be around a tenth behind him. 2009: Powell ranked #3 in 9.82, runs 9.84 and finishes 3rd at WCs. Now here he didn’t necessarily choke, but he certainly didn’t exceed any expectations, and it would take him going above and beyond to beat Bolt. Powell has built his career off of under-performing in championship finals, and he has given absolutely no legitimate reason to think he is going to do anything differently this year, and it seems like the only way you guys could honestly think he has a chance of beating Bolt is by ignoring everything he has done for the better part of of the last decade. ^^^I understand the point that your making. Even if Bolt has an “off” day, it would still take Powell AT HIS BEST, to beat him. Not to mention Powell’s “successfulness” in major competition. It all comes down to which Bolt shows up. Based upon Powell’s record it would seem unlikely that Powell will drop a 9.7 run in the Daegu final. If Bolt does I don’t see Powell getting better than silver and that is based upon the Berlin Powell showing up not the Beijing, Osaka or Athens Powell. If the Berlin Powell shows up currently the only sprinters I give a chance to take silver from him would be Thompson or Dix (and Dix has really shown nothing this year to imply he is ready for mid to low 9.8s but he’s a gamer so what the heck). For some reason I just don’t see Rodgers pulling it off (and I felt this way even before the current stimulant issue). I don’t think Gatlin is ready to repeat his Athens form, Lemaitre I don’t believe is ready to drop a mid 9.8 either and that leaves Mr. Yohan Blake. I still like him as a sleeper - I hope he surprises. Until proven wrong, I believe in Dix’ ability to pull one out of his arse in the championship final. Thompson has the same MO and just ran great in T&T nationals. Powell is hurt by the rounds and isn’t the same guy afterwards (see narrow victory at Jamaican Champs despite 9.78 or whatever one-off thing he does). Blake I like, but he’s pretty inexperienced. 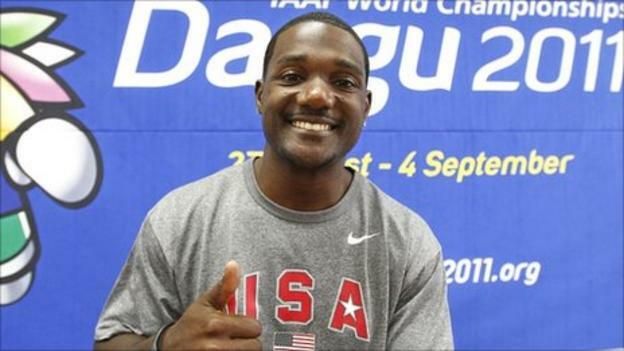 American sprinter Justin Gatlin arrives at the World Championships suffering from frostbite. Blistered and scarred, American sprinter Justin Gatlin arrived at the world championships with frostbite on both feet. Pussed up feet may not be fleet! sub 10 to get into the finals? sub 10.05? -110 degrees C. It could happen with wet socks vs. dry. You know what, I’m really pulling for Powell this time around. I’ll be happiest if Dix wins, but the likelihood of that is so small that it’s not worth getting anxious about. This is Powell’s last realistic chance of nabbing a Gold on the world stage. It would be naive to assume that Bolt is going to make the same mistakes training next year for the Olympics that he did this year, and I fully expect him and Gay to come back with a vengeance next year regardless of what happens at Worlds. I’m pulling for Powell for his sanity also. How long has this guy been around? Just ONE win would totally validate him in his own head and probably take the monkey off his back for future competitions. He’s beaten Bolt before, and is confident going in with some great times this season. Bolt looks shaky, and also has the OTHER Jamaicans to worry about. Prime position, prime timing, good luck Powell. long way out but —I’m thinking Yohan Blake might be the guy to beat come 2012OG at Mr Coe’s House. In NYC Universal is airing “Best of <>League 2011” a 2 hr show. If they edited it with a new soundtrack ( you know so they can ID the athletes correctly) that would be a plus. First, yes I would be pretty pleased to see Powell win. The guy just has looked so down in the dumps after poor performances in majors. Beijing in particular comes to mind. And the best thing is I bet Bolt would be the first to congratulate him. Second - and sorry if this is dumb - what training mistakes has Bolt made this year? In mean that insofar as whatever he did in '09 to run 9.58 & 19.19 that he didn’t do this year. I don’t reasonably expect him to run 9.70 or faster at Worlds, which is far off his best so whatever he did differently this year isn’t paying off for him as well (against my own slighted comment, he’s still won nearly everything). See what he ran in the leadup to the '09 World Champs- it didn’t look like 9.5x and 19.1x were happening. Not to say he’ll do that again, but I wouldn’t question whatever his coach does in the leadups to major Champs. Especially after he consecutively had the two best sprint doubles ever in the past two championships. No but it was a bit more impressive both in '08 and in '09 than what he’s done in '11. He had a relatively unimpressive season in '10, so that’s why I could see Powell pulling it off if he gets his act together. Then again, he obviously gets MADLY pumped before these huge races and always shows up. I guess my prediction is that he’ll win, unless there’s a false start to kill his buzz. Seems to me Bolt’s issues are still connected to last year’s back problems. I don’t think they’ve changed much up . . . I think they are simply dealing with a different physical status.